Araucaria heterophylla, as described in 1952 by (Richard Anthony Salisbury) João Manuel Antonio do Amaral Franco, in Anais. Instituto Superior de Agronomia, 19th edition, is commonly known as Norfolk Island pine. It is synonymous with A. excelsa (R. Br. ex Aiton) and sometimes called a Star pine, Triangle tree or Living Christmas tree, due to its symmetrical shape as a sapling, although it is not a true pine. The epithet, heterophylla, or "different leaves" in the Latin language derives from the variation in the leaves between young and adult plants. Description. Norfolk Island pine is an evergreen coniferous species of tree which will grow to a mature height of 150 to 200 feet (50 – 65 m) tall, with straight vertical trunks and symmetrical branches, even in the face of incessant onshore winds that can contort most other species. Bark is gray-brown, exfoliating in fine scales. Branches grow in a flat horizontal plane, sometimes pendent, producing branchlets in whorls of 4 to 7. Foliage is needle-like and are awl-shaped, 0.4 to 0.6 inch (1 - 1.5 cm) long, about 0.04 inch (1 mm) thick at the base on young trees, and incurved, 0.2 to 0.4 inch (5 – 10 mm) long and variably ca. 0.12 inch (2 – 4 mm) broad on older trees. The thickest, scale-like leaves on coning branches are in the upper crown. Seed cones are squat and globose, 4 to 5 inches (10 – 12 cm) long and 5 to 5.5 inches (12 – 14 cm) in diameter taking about 18 months to mature. They disintegrate at maturity to release the nut-like edible seeds. Norfolk island where it appears on Earth. Distribution. As its vernacular name Norfolk Island Pine implies, the tree is endemic to Norfolk Island, a small island in the Pacific Ocean between Australia, New Zealand and New Caledonia. Ethnobotany. The first European known to have sighted Norfolk Island was Captain James Cook, in 1774 on his second voyage to the South Pacific in HMS Resolution. Cook noted the presence of large quantities of tall, straight trees which appeared to be suitable for use as masts and yards for sailing ships. 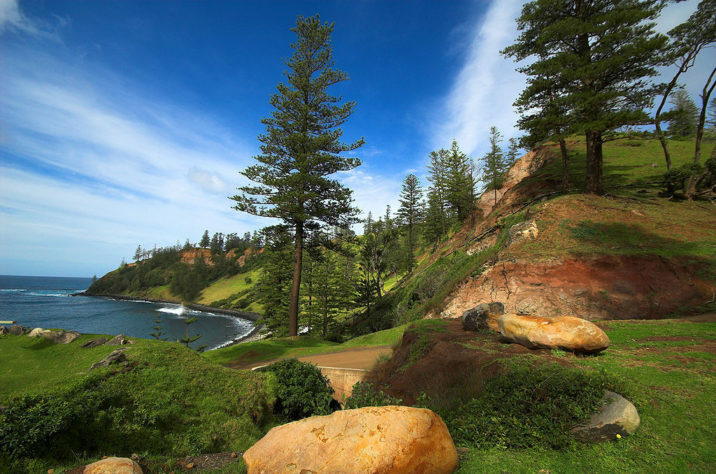 However, when the island was occupied in 1788 by convicts transported from Britain, it was found that Norfolk Island Pine was not resilient enough for these uses and the industry was abandoned. The distinctive appearance of this tree, with its widely spaced branches and symmetrical, triangular outline, has made it a popular cultivated species, either as a single tree or in avenues. When the tree reaches maturity, the shape may become less symmetrical. 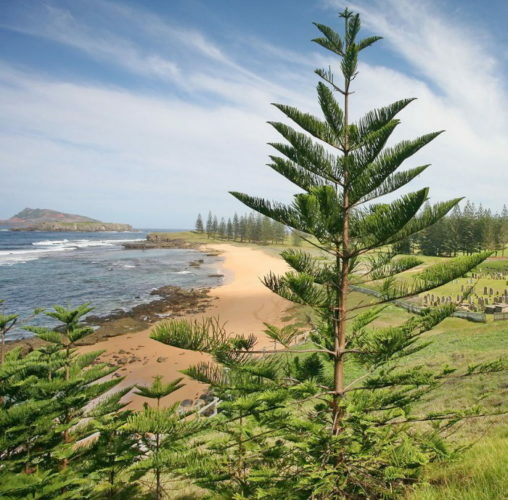 Despite the endemic implication of the species name Norfolk Island Pine, it is distributed extensively across coastal areas of the world in Mediterranean and Humid Subtropical climate regions due to its exotic, pleasing appearance and fairly broad climatic adaptability. As well as their eponomously native Norfolk Island, Norfolk Island Pines are planted abundantly as ornamental trees throughout coastal areas of Australia, Brazil, Chile, New Zealand, Portugal, South Africa, Spain, and even coastal areas of the United States, such as coastal Southern California, Florida, and the northwestern-most coast of Mexico. Many of the "Norfolk Island pines" growing in Hawaii, including their descendants growing as potted ornamentals on the U.S. mainland, are actually Cook pines, the two species having been confused when introduced. Araucaria heterophylla grows well in deep sand, as long as it receives reliable water when young. This, and its tolerance of salt and wind, makes it ideal for coastal situations. Additionally, it is necessary for the species to be grown in oceanic coastal areas because bodies of fresh water do not provide enough precipitation, moisture, consistent wind levels and no saline air which are all things the species requires. Young trees are often grown as houseplants in areas where the winters are too cold for them to grow outside (they will not, for example, survive outdoors in most of North America or Europe), and are sometimes used as Christmas trees. It will not survive in areas subject to prolonged cold. However, there is a specimen growing outdoors in the subtropical gardens of Tresco Abbey Gardens on the Isles of Scilly, in the United Kingdom. 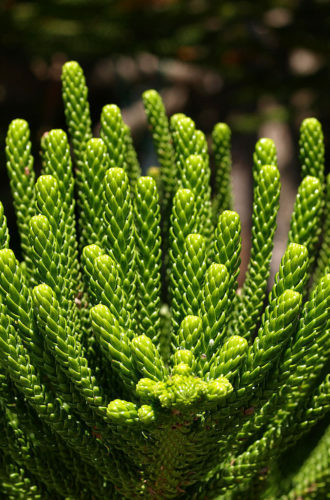 Large numbers of Norfolk Island Pines are produced in South Florida for the houseplant industry. The bulk of these are shipped to grocery stores, discount retailers and garden centers during November. Many of these are sprayed with a light coating of green paint prior to sale to increase their eye appeal, although this may weaken or even kill the plant if it cannot photosynthesize adequately. Even in Florida, these trees are subject to frost damage and produce multiple stems with weakly attached trunks - in the 2004 hurricane season, many of these trees failed under the 160 km/h winds. As a result some coastal communities (e.g. Vero Beach) prohibit their use as a tree in local landscape plan approvals because of the danger posed by falling trunks. 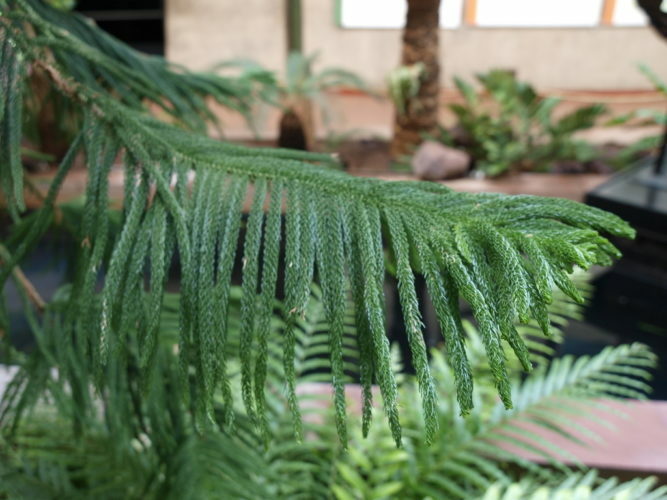 Araucaria heterophylla (Norfolk Island pine) in a conservatory. Most Norfolk Island pines in the US are houseplants. Araucaria heterophylla (Norfolk Island pines) in habitat on Norfolk Island. 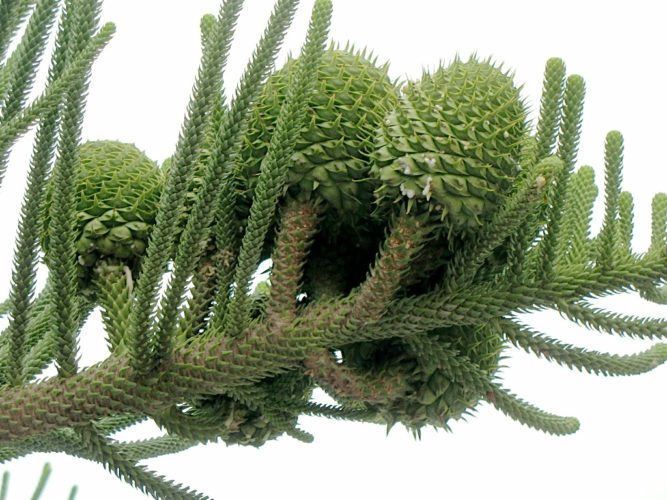 Araucaria heterophylla — detail of cones and foliage. 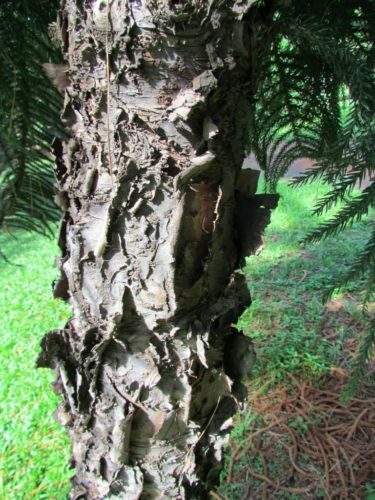 Araucaria heterophylla — a closeup of bark detail, at Montgomery Research facility, Coral Gables, Florida. Norfolk Island pine (Araucaria heterophylla,) near Kingston, Norfolk Island. 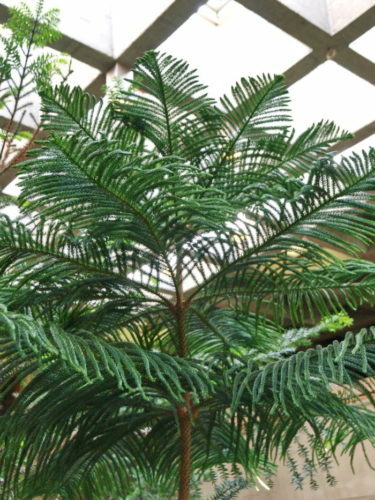 Araucaria heterophylla (Norfolk Island pine) in a conservatory.